In the center, we have the Luther Rose, which reminds me to seek scripture over tradition, faith over works, and grace over merit. Praying the hours buys me nothing, earns me nothing, and means nothing if it does not keep me rooted in the Word. The golden rays remind me that all I do must be illuminated by the Word. The cross divides my day into quadrants, each containing two "hours." The hours themselves are in three hour intervals, from midnight to noon and back to midnight. The typical course of my day is seen in the hearts, each straddling two "hours" and filling one quadrant of the day, night, morning, afternoon, and evening. From midnight to six, I am generally sleeping. From six to eight, getting ready for the day, from eight to noon I am working, with my first class beginning at 8:50. From noon to three I spend visiting friends or reading. From three to six I am doing things around the house, picking Eliana up from school, getting dinner ready, etc. From six to nine we are eating dinner and doing household activities like homework, dishes, etc. From nine to midnight I am getting ready for bed and going to bed. As I looked at how my day was divided, I saw that the four loves nestle nicely into the quadrants, beginning with the time I spend solely with my spouse (eros), to the time I spend teaching children and interacting with coworkers (agape), to the time I spend with friends (philia), and the time I spend at home with my family (storge). While those quadrants do not impact praying the hours, they do remind me of the different ways I reflect God's love to others over the course of my day, and that is directly impacted by my time in scripture and prayer. The smaller circles before and after each hour provide space for putting aside my thoughts of the day and settling into prayer as well as stepping out of prayer and contemplating where God is leading me next in my day and activities. It is the time for easing into and out of formal prayer, while remaining in a state of watchfulness and wakefulness to the Spirit within and the world without. I do not anticipate praying the Lauds, as I am usually asleep at 3am, but also leave room for restless, wakeful nights and remind myself to spend that time in prayer. If God sees fit to wake me, then I will praise Him for that time of prayer that would otherwise have been lost to me. The last few on the list I’m working through systematically as the liturgical year progresses, so they are not ones I make significant, so much as steady, progress on. The last week was a difficult one, with events commemorating Bill Terry’s life and passing occupying my time and thoughts. I didn’t read as much as I had been, but that’s okay. The habits and patterns of reading interrupted by grief will return, sooner for me than for the family, so for now I will mourn with those who mourn, leaving time and space for reflection and prayer when I find myself unable to focus on the words on the page. The world needs Christian scientists. The world needs Christian mathematicians. The world needs Christian authors. The world needs Christian musicians. The world needs Christian doctors. The world needs Christian engineers. The world needs Christian philosophers. The world needs Christian teachers. The world needs Christian fathers. The world needs Christian mothers. I just learned of his sudden death, the husband of my friend, the father of my students, whom we have known for years. And I am at a loss, for words, for her, for them. God, grant them peace. all the air in the room. My 12 year old daughter told me recently that I have a “very bad habit of reading more than one book at a time.” I told her it wasn’t a bad habit at all! When I read more than one book at a time, the books get to talk to each other! I like listening in to the conversation my books are having with each other. More often than not, there are themes that arise across the books I am reading, in places I don’t expect. That is part of the joy of reading! Newton’s Principia - this begins with a beautiful poem by Edmond Halley and continues in discussing the precision of geometry, and the imprecision of mechanics and language. He is also talking about ratio and proportion and the discovery of large truths from small truths. Sounding the Seasons by Malcom Guite - this is book of poetry that begins with the mathematical proportionality of a sonnet and the aesthetic appeal of a black square of text on a white page, as well as the appropriateness of of the sonnet form developing out of an oral tradition of poetry. Beauty for Truth’s Sake by Stratford Caldecott - more math discussion here, coupled with wonder and enchantment, which happened to be the central ideas of a book I recently finished: Recapturing the Wonder by Mike Cosper. Neither of these books I chose for myself; one was a Christmas gift and the other is reading for school. And yet... they’re happily chatting away with each other and I am fortunate enough to be listening in. Beauty for Truth’s Sake is also conversing with the Principia. 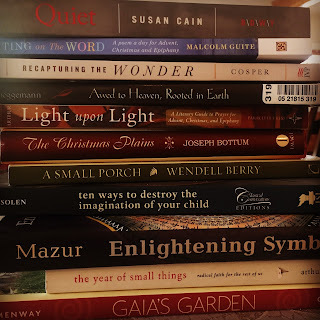 Anthony Esolen’s Ten Ways to Destroy the Imagination of Your Child - this is another read for school, and its introduction is having a brief discussion with Sounding the Seasons on the importance of memory and the value of poetry. Gaia’s Garden by Toby Hemenway - this book on permaculture has a surprising amount to discuss with the other books I’m reading, especially the books by Esolen, Caldecott, and Guite. While the book is focused on permaculture in gardening, the introduction discusses the wide range of application for permaculture, which seems to be an overarching theme, albeit in different terminology, among several of the other books I’m reading. This interlocution has been a delightful discovery. A Small Porch by Wendell Berry - part poet, part farmer, Wendell Berry has much to say in this collection of poems and essay on the Sabbath that intertwines with Gaia’s Garden and Sounding the Seasons and Beauty for Truth’s Sake. Enlightening Symbols by Joseph Mazur - this short history of mathematical notation begins with a contrast of the symbolism inherent in language, specifically poetry, and math. It is an etymology, of sorts, of mathematical notation, and as such it finds itself seated at the table, in conversation with Newton and Caldecott, and with Berry and Guite, and with Latin, with which my days are filled. So... these are the central contributors to the current colloquium. As I finish some books and begin new ones, the conversation will change in new and interesting ways, but the conversation will continue. That is what it means to read. I read, not to be immersed in some other world and escape this one, but to allow the conversation of other times and other places to draw me in that I may be fully immersed in THIS world. And that seems like a very good habit indeed. If, of course, you mean the new year of 2019, not the liturgical new year, which began with Advent a month ago. I did stay awake last night to see the new year in, but I wasn't awake for much longer than that. This morning the house is quiet, and it is a welcome reprieve in a busy season. The week will pick back up with activity tomorrow, but today is a pause, a rest, as I ponder the new year and how I will be shaped in it. One of the things I am shaped by is what I read. Books. Words. Verba. Waiting on the Word by Malcom Guite, which is written around a poem a day for Advent, Christmas, and Epiphany. Malcome Guite is coming to Bozeman this spring, and I am excited to hear him speak. I ordered his book Sounding the Seasons, which is a book of seventy sonnets for the Christian year and I plan to read that over the course of this year. I am really enjoying reading The Christmas Plains by Joseph Bottum. On loan from a friend, I had to order myself a copy to read next Christmas as well. It is beautifully written and I love how he plays with memories and words and truth that meanders its way through all. That I will have finished by Friday, when I return it to my friend. I am in the last chapter and, honestly, hope that I will have time today to enjoy that last bit of the book. I am reading Light upon Light compiled by Sarah Arthur again this year. It is full of literary compilations for each week of Advent, Christmas, and Epiphany. That should last into March. For Christmas, my brother-in-law got me a copy of her Ordinary Time compilation, which I am looking forward to reading this summer and fall. Recapturing the Wonder by Mike Cosper. This was a gift from another friend and I am two chapters in. It is full of deep thoughts, beautifully written, about the disenchantment of ourselves and our world and how to regain a transcendent faith in a disenchanted world. This book, I think, will play into a lot of my thoughts this year. Newton's Principia. This is taking me a while to work through, but is rich and deep and beautiful on a mathematical level I have never understood. Newton lived in an enchanted world, and I think that makes all the difference in the beauty of his thoughts. Eve in Exile by Rebekah Merkle which is an apology for the restoration of femininity. I'm about a quarter of the way through. Sabbath by Dan Allender. This and the next are part of my exploration and fleshing out of Sabbath practices. This is an area in which I'd like to grow this year. A Small Porch by Wendell Berry. This was a gift from a friend who spent some time fleshing out her own family's Sabbath practices. This is one she found helpful in her own Sabbath journey and gave to help me along mine. The Year of Small Things by Sarah Arthur and Erin Wasinger. 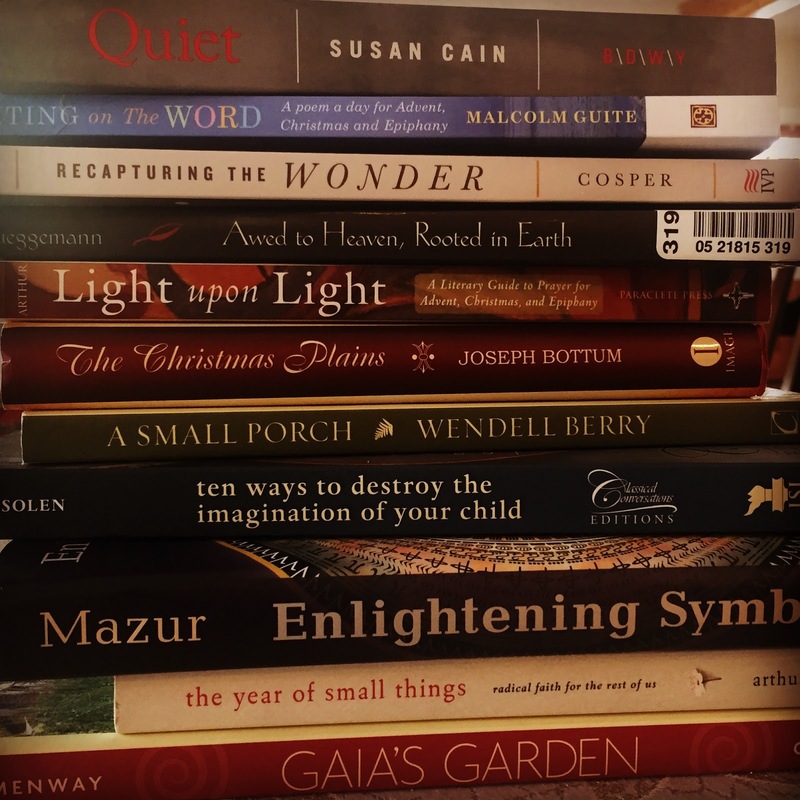 Along the lines of Sabbath practices, this chronicles a year of small practices two families implemented to shape the liturgies and habits of their lives in the midst of the busy season of child rearing. Quiet by Susan Cain. I've had this book on my shelf for a couple years and have decided it is time to read it. Ten Ways to Destroy the Imagination of Your Child by Anthony Esolen. This goes along with the idea of inhabiting an enchanted world. I'm looking forward to reading it. Beauty for Truth's Sake by Stratford Caldecott. This is a book on the Quadrivium, which sort of falls in line with Newton's Principia and the next book. I seem to have a bit of a math theme going on this year. Norms and Nobility by David Hicks. This is another I have had on my shelf and not yet read. There are a few of us who are hoping to read through it this summer, when school is taking up less of our brain space. Enlightening Symbols by Joseph Mazur. This is a short history of mathematical notation, more or less from the beginning up to Newton. 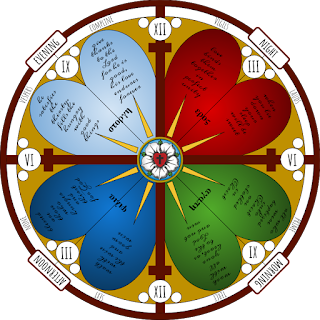 It is in essence an etymology of mathematical symbolism and the stories surrounding their development and use. This is the book Leif got me for Jolabokaflod this year. Gaia's Garden by Toby Hemenway. This is a book on permaculture and one I am reading with a friend during the month of January in anticipation of this summer's garden. I am looking forward to both the book and the time spent in discussion with my friend. So there you have it... Some of the things I hope to read over the course of this year. I am sure there are others that will make their way onto my list as well, like The Wingfeather Saga and other works of fiction. I will finish reading The Last Unicorn with Eliana. It is such a beautiful story. Sometimes it is these works of fiction that capture the imagination most, with stories that are truer than fact. That is their beauty, after all. That is what draws us in. If the One we celebrate this season is the Word of God, and we are made in the image of the Word, then our words, no matter who we are, in some way reflect the Word in us. Often, our words are a distortion of the the Word, twisted by sin, but where there is a glimmer of truth, goodness, or beauty, it is because He is the Word. We are rooted in Him in a way that we can not escape, no matter how far we run or how deep we hide. And so, words resonate with us. We read because we are drawn to the truth, beauty, and goodness we find in the words, that the words find in us. We read, because deep down, what we long for is the Word, and what the Word longs for is us. Here it is, on New Year's Eve, and I am home, in pajamas, not quite alone, but functionally so as I tidy up the aftermath of Saturday's Christmas celebration with my in-laws and my husband does whatever he's doing upstairs. Our 12 year old daughter is the only one with plans tonight, and I imagine she is having a grand time with friends, watching movies, eating, and staying up well past her typical bedtime. My aim is to start the new year with a calm, peaceful living room that will look very much like it did before Saturday's festivities. My aim is also to go to bed shortly after midnight, if I make it another hour. The mess tells me I still have an hour to go, so I will probably still be up to see the new year in. Whether I am or not, the 2019 will arrive. It doesn't need pomp and circumstance, it just needs time. With it, though, is a new year in which to declare Christ as Lord. Having just celebrated his birth a week ago, it is time to remember His lordship as we ring in the 2019th year of the reign of our Lord, Jesus Christ. I do not think it coincidental that we mark the passing of time with reference to the birth of Christ, though I think we often forget why we number our years as we do. It is easy to forget, on nights like this that are quiet and dark and cold - it's -7* outside currently - that we are in the midst of Christmastide, of celebrating the hope that has come and is coming again! As we wait in anticipation of the new year, may we remember that we serve a King who already sits on the throne, whose image is stamped on our souls, whose light shines in the darkness, who is our hope and our peace. Tonight, we celebrate, as people around the world declare that Jesus Christ is Lord with the ringing in of a new year. Tomorrow, we continue looking forward to the day when every tongue confesses that He is Lord. Happy New Year! the 8th day of Christmas. New Year of our Lord. On New Year's Eve, Anno Domini, Advent, and Christmastide.